Any intervention that penetrates and exposes a body cavity; any procedure that has the potential for inducing permanent physical or physiological impairment; and/or any procedure associated with orthopedics or extensive tissue dissection or transection. Any surgical intervention that neither penetrates and exposes a body cavity nor induces permanent impairment of physical or physiological function. Examples in our lab include examination and cleaning of the contents of recording chambers, superficial and percutaneous biopsies, debriding, cleaning and suturing of bite wounds, etc. All major surgery in our laboratory is carried out under general anesthesia (balanced anesthesia consisting of isoflurane 1.3% and fentanyl 3 µg/kg IV injections, with 1.8 L/min N2O and 1.0 L/min O2). Minor surgery is carried out with ketamine (10-15 mg/kg). Chamber cleaning does not require any anesthesia. Anesthesia is also required during some of the fMRI experiments. In such experiments the procedure is as follows: After premedication with glycopyrrolate (IM 0.01 mg/kg) and ketamine (IM 15 mg/kg), a 20-gauge intravenous catheter is introduced into the saphenous vein, and the monitors (HP OmniCare/CMS; ECG, NIBP, CO2, SpO2, temperature) are connected. The monkeys are preoxygenated and anesthesia is induced with fentanyl (3 µg/kg), thiopental (5 mg/kg), and succinylcholine chloride (3mg/kg). Following the intubation of the trachea, the lungs are ventilated using a Servo Ventilator 900 C Siemens, Germany), maintaining an end-tidal CO2 of 33 mm Hg and oxygen saturation over 95%. Balanced anesthesia is maintained with end-tidal 0.35% (0.23 MAC for macaques) isoflurane in air and fentanyl (3 µg/kg/hr). Muscle relaxation is achieved with mivacurium (5 mg/kg/h). Body temperature is kept constant, and Ringer’s lactate solution is given at a rate of 10 ml/kg/h. Intravascular volume is maintained by administering colloids (hydroxyethyl starch, 30-50ml over 1-2 minutes as needed). Emergence from anesthesia is typically without complications and lasts an average of 30 minutes. The paralytic and fentanyl are stopped, and ventilation is lowered to stimulate spontaneous breathing. When spontaneous respiration is assured and the CO2 is below 40 mm Hg, the trachea is extubated. During the entire experiment, we continuously monitor the vital signs of the monkey, responding accordingly and thereby controlling the depth of anesthesia. The above protocol was found to be ideal for both imaging and for the elimination of any discomfort to the animal. It is well known that discomfort or stress would be masked by muscle paralysis, so it was important to establish what levels of light anesthesia are appropriate to avoid suppression of cortical activity, reduce the anesthesia depth-dependent breakdown of the brain’s autoregulation, and ensure the elimination of stress to the animal. To address this question we took the extra precaution of examining the concentration of plasma catecholamines (adrenaline, noradrenaline and dopamine) for different anesthesia protocols for five critical manipulations of the animal (immediately after intubation and stereotactic positioning, 20 and 120 minutes after upright positioning, and at 0 and 20 min after supine repositioning). For the protocol used in these experiments, all stress hormones (see included table) were found to be within the normal range. Because normal values for catecholamine concentrations could only be found for humans, we also examined plasma catecholamines in control blood samples collected from the same animals in their home cages. Stress in this situation is obviously not related to pain or discomfort, but rather to the restraint procedure and possibly to the sight of the syringe. The concentrations of noradrenaline and adrenaline during the experiments were only 10% and 4%, respectively, of those measured when the control blood samples were taken. Dopamine was present only in the control blood samples. See appendix 2 for details of our anesthesia techniques and protocols. 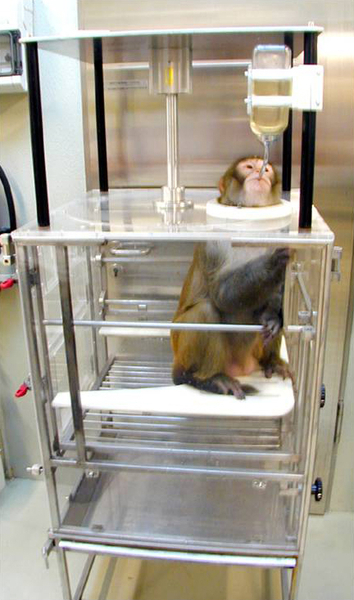 Table: Stress-hormone analysis during a typical fMRI experiment with anesthetized monkeys. Blood samples were obtained at six time points (A through F) and the plasma concentrations of noradrenaline, adrenaline, and dopamine were measured. A. Intubation/stereotactic positioning, B. 20 min after upright positioning, C. 2 h after upright positioning, D. Supine positioning, E. 20 min after supine positioning, F. Blood sample from home cage. Normal values in the plasma of resting human subjects in nanograms per deciliter: adrenaline (8-16 ng/dl), noradrenaline (8-53 ng/dl), dopamine (< 8ng/dl). As a control, column F shows the concentration of stress hormones during the collection of a blood sample in the home cage of the animal. The routine for surgical procedures is as follows: One day before the operation the monkey is administered antibiotics (Tribrissen 30 mg/kg, orally) and analgesics (Finadyne: flunixin meglumine 5 mg/kg, SC). In the night before the operation food is no longer offered but water is freely available until 3 hours before the operation. Fifteen minutes before pre-anesthesia the monkeys are given a Robinul injection (glycopyrrolate, 0.01 mg/kg, IM) in order to reduce vagus reflex activity. Then the animal is immobilized with an intramuscular dose of ketamine (10-15 mg/kg). An intravenous catheter is inserted into the saphenous vein and rinsed with heparin-containing saline (two units/ml). The catheter is fixed on the surrounding skin and secured with a bandage. Anesthesia is completed with pentobarbital (the injection dose for an animal pre-anesthetized with ketamine is 8 mg/kg). The trachea is sprayed with Cetacain for a second and then a tracheal tube is introduced. The operation sites are smeared with Betadine and Nolvasan. Additional doses of antibiotics (Tribrissen 0.11 ml/kg) and analgesics (buprenorphine 0.01 to 0.03 mg/kg, IM) are administered. Afterwards the animal is put onto the operation table and is once again smeared with Betadine and Nolvasan. The somatic reactions are continuously monitored, particularly during operations. Before cuts are made or the animal is placed in the stereotactic head holder (for attaching the holding piece) the incision sites and the pressure points are infiltrated with local anesthetics (2% lidocaine). During the operation the animal receives 5% dextrose in Ringer´s lactate solution at a rate of 15 ml/kg/hour. Heart beat, blood pressure and respiration are constantly monitored and recorded every 15 minutes. The body temperature is kept at 38.80°C using a heating pad. Isoflurane (1.2 to 1.5% at 0.8 L/min) is given for the maintenance of anesthesia. Salivary flow is controlled with additional doses of Robinul. At the end of the operation the tracheal tube is removed and the animal is allowed to slowly wake up. During this recovery phase the animal receives 5% dextrose in Ringer´s lactate solution at a rate of 20-40 ml/kg/hour. Only when the animal’s condition is stable is it put into a special recovery chair (see section "Recovery Chair" below). All animals receive antibiotics (Tribrissen) for five to seven days and analgesics (Finadyne) for the three days following the operation. 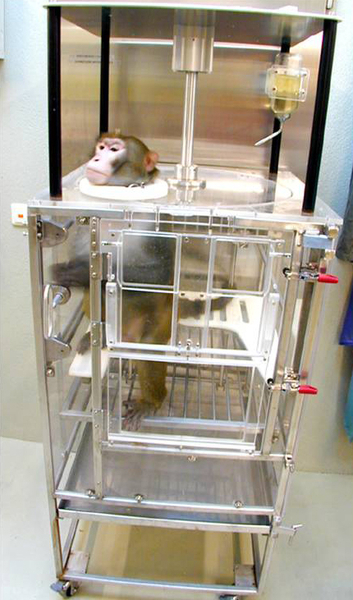 The head of the anesthetized monkey is immobilized in a stereotactic apparatus. After cleaning and disinfecting, the operation field is prepared. On the median, formed by the Meati acusti externi, a caudally oriented semicircular skin incision is made in order to uncover the cranium for placing the holder. The cranial skin flap is fixed on the Os frontale with gauze soaked in physiological saline (NaCl 0.9%). The muscular fasciae and the connective tissue are intersected and shifted caudally and cranially. The frontal and the temporal muscles are removed from the cranium on both sides in a lateral direction using a raspatory. The cranium is thoroughly cleaned of blood and muscle protein. Using the stereotactic device, the individually fitted headpost is placed in the correct position and the designated screw positions are marked with a sterile marker. At the marked positions holes are drilled and ceramic screws are used to fasten the headpost to the bone. The wire (see "Implantation of the Eye Movement Search Coil" above) is pulled from the jugal incision along the cranial profile underneath the cranial muscles to the headpost with a needle in order to avoid embedding the wire in the muscles. This coil wire is placed in the headpost via a plastic guide. Two to three ceramic screws are anchored inside the cylinder of the headpost in order to stabilize the headpost’s position. In addition, the headpost chamber is filled with biocompatible quick-curing plastic, making sure that the wire of the eye movement search coil can still reach the plug in the headpost. An incision is made in the cranial skin flap, which is then pulled over the cylinder of the headpost. Fasciae, subcutis and skin are separately sutured. After the skin wound is closed, the wire and plug are connected and the chamber is closed. After completion of the operation, the animal is taken out of the apparatus and the recovery phase is started. In our experience, covering the cranial bone with varnish is a very reliable method for preventing rejection of the plastic material used to fix the headpost. If the headpost is made of titanium the cranium is not covered with varnish, and titanium screws are used instead of ceramic screws. Since titanium is a more stable material than PEEK no stabilization with screws and quick-curing plastic material is necessary. The implantation procedure is the same in both cases. The position of the chamber and the type of cylinder used varies from project to project. Here we describe one particular set-up, but all other cylinder types are placed in a similar way. For inferotemporal recordings such as those that we carry out in the recognition project, permanent access is necessary. In this case, the chamber consists of a ball and socket connected by a 21 gauge stainless steel tube through the center. The tube is inserted into the brain exactly above the lateral fissure using a stereotactic apparatus, and it remains there for the duration of the recordings. The stereotactic coordinates of the anchoring point are 21L and 15A. 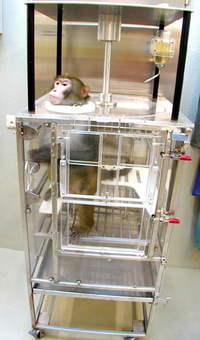 The head of the anesthetized monkey is immobilized in a stereotactic apparatus. After cleaning and disinfecting, the operation field is prepared. A ca. 4 to 5 cm long skin incision is made laterally at the cranium above and parallel to the above-mentioned fissure. The skin is lifted off and carefully spread out at the sides. The edges of the wound are covered with gauze soaked in physiological saline (NaCl 0.9%). Skin bleeding is controlled by a tourniquet or electric coagulation using a bipolar coagulator. At the designated chamber position a dissection is performed along the course of the myofibrils to the cranial bone. Corresponding to the size of the chamber the muscle is separated from the bone and spread in the laterocranial and laterocaudal directions. The cranial bone is cleaned and the exact position of the ball-and-socket chamber is placed according to the desired coordinates and angles, marking the center of the corridor and the position of the screws with a sterile marker. A hole of 6 mm outer diameter is drilled through the cranium as the entry point for the electrode guide (center of the corridor), and paracentesis of the dura mater is performed. In order to protect the dura mater, the opening is covered with a sponge soaked in physiological saline (NaCl 0.9%). The screw holes are then drilled. Using the stereotactic apparatus the chamber is positioned above the designated center in such a way that the electrode guide advances past the dura mater by about 10 mm. The chamber is fixed in the designated position with titanium screws. The muscle is repositioned, fasciae, subcutis and skin are separately sutured, and the monkey is taken out of the stereotactic holding device. The wake-up and postsurgical recovery phases follow. After fixation of the chambers with ceramic screws they are sealed with biocompatible, quick-curing plastic material. In order to facilitate the measurement of cell activity, the electrode chamber is usually placed upright over the brain area to be studied (e.g. the inferotemporal cortex). Some areas are very small, however, which requires extremely precise placement of the implant. We achieve this using an MR-based navigation system. First we make an anatomical MRI scan of the skull (see above). With a video camera and special markers we are then able to monitor the positioning of the chamber in the brain during the operation, particularly the orientation of the chamber so that it points directly at the area of interest. We tested the suitability of this system for our work in a series of preliminary experiments and will employ it when needed for the positioning of the chambers. After head surgery (implantations) the wound needs time to heal and infections have to be prevented. For our operation method this can only be achieved by keeping the monkeys for a few days in a special chair, the so-called rotation chair or recovery chair. In comparison to the primate chair used during experiments, this chair gives the animal more room to move, but stops it from touching the wound with its hand or fingers and thus inserting germs that naturally cling to them into the fresh surgical wound which might then lead to an infection. The animals are able to sit in the chair, straighten themselves, turn and move. They have unrestricted access to water and are fed by the animal care staff. Monkey during the recovery phase in the recovery chair. Monkey sitting in the recovery chair while drinking. By improving implantation and suturing techniques we managed to shorten the recovery time in the recovery chair to 1-3 days. During recovery in the recovery chair vital functions, food intake and metabolic activities are intensively monitored, and the healing process is supported by considerate care. In order to prevent muscle wasting, the animal is taken out of the chair for a walk twice a day. For entertainment, the animals have the opportunity to watch television. The recovery chair offers the additional advantage that the freshly operated and thus weakened animals do not have to prove themselves straight away in the ranking order of their primate group.